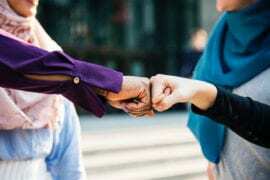 A while back, we posted out an article called ‘5 Wardrobe Hacks of Productive Muslimah‘ and we got a hugely positive response. It seems that us sisters can allow our wardrobes to get the better of us and it can impact on our productivity too. In light of this, I wanted to share with you all another few secrets from my closet but this time related to the all essentials in a handbag that most sisters carry around. One of the common issues I have found with sisters – whether they are students, mothers or professionals – is that they can often not find the most important thing whilst rummaging through their handbag. At important times (during a meeting or when you are travelling), it is time-saving to have everything well organised in your handbag, to be able to access things quickly and easily whilst carrying less unnecessary baggage – this will ultimately make us better organised and more productive. Many women will say that a handbag is an essential accessory, so if it is organised it can have huge positives. An organised handbag can create a stress-free mind, can boost productivity and even has physical benefits by choosing to carry a light bag that is good for your shoulders and back. From personal experience, investing in a good travel bag, travelling lighter with the essentials only, has helped to de-clutter my mind; my thought process is clearer and it has also reduced the aching shoulders I used to get from carrying around a bigger bag! Of course, every sister has their own preference so this article is not about what kind of bag to buy (although I’ll share some of my top buys!). I’ll be showing you how to organise your handbag and choose the bare minimum essentials that we should carry around to boost your emotional, social, and work productivity. It’s a Mum’s nightmare when she can’t find the dummy or wipes! Worst case scenario: you lose things or it gets stolen because you haven’t thought about practicalities of your bag. Carrying a well organised bag which is relatively light, secure and compartmentalised is key to having a productive handbag. So what should go in my handbag? I have managed to whittle my hand bag down a few sizes and pack only these 10 items. Many sisters tend to think they need to carry more than they actually do but I have found it to be super useful to organise my bag with only these items in the last few months. It is also important to note that a regular de-clutter of the bags you carry around is needed so that things don’t pile up and take up space. For example, every 2 weeks I throw away receipts that I don’t need from the bag and file away documents/letters. Sometimes it can be hard to know where to start with organising all the contents of a bag. Firstly, it is important to buy a bag with lots of compartments, both open and zipped. I have used an approach of using these separated compartments in my bag; important items like bank cards and cash go in the zipped or card sized pockets of the bag – this makes it easy to get out when I need to pay at shops and ensures they are safe and secure from falling out. This also saves me space because I don’t have to carry around a big fat purse. In fact, I have been purse free for 6 months much to the relief of my handbag! If you need to carry cash, you can use cute coin purses that only have space for coins and a few notes. Additionally, place important documents in envelopes and see-through pocket folders so that you can easily locate and see the relevant documents you need, especially details such as flights, booking references, plans and itineraries etc. What kind of bag should I carry? We are spoilt for choice when it comes to bags and often the latest fashion trend can encourage women to buy impractical bags that are bigger than they need. Unless you are carrying a laptop or a Mum’s bag for packing baby essentials, I suggest keeping the handbag to the size of an A4 paper. My favourite to use lately has been a small ‘satchel’ that can be easily and lightly worn on the shoulder or acoss the body, like these which can be found in any high street shop. Enough to fit all the essentials mentioned above and important documents – practical and stylish! For any extras I have to carry, I tend to buy bags made from canvas material, which are strong but feel light on the shoulders, are reusable and are also handy for carrying things casually like extra clothes or shoes. Check out canvas bags here, or you can get some cool and creative recycled ones online too. What about a Mum-friendly bag? We know mums usually have more to carry so here are some tips for mums when packing their bigger bags. Ensure you have plenty of compartments and side pockets for keeping the baby’s bottle in the side, sterile wipes and tissues for any accidents, extra clothes, transparent cases (useful for medication/creams) and also containers for children’s food. One of the worst things for mums is not being able to find what they need whilst baby is crying so make sure you know exactly where you’ve put each item (this is where compartments come in handy!) and if need be, you can also easily direct someone else to grab it for you. Who knew that there could be such an art to a handbag? I hope all the above tips will make carrying a handbag less of a nightmare and chore, prevent you from being late to a meeting or finding that all important document when you need it, leading to a more stress-free productive day for you sisters! 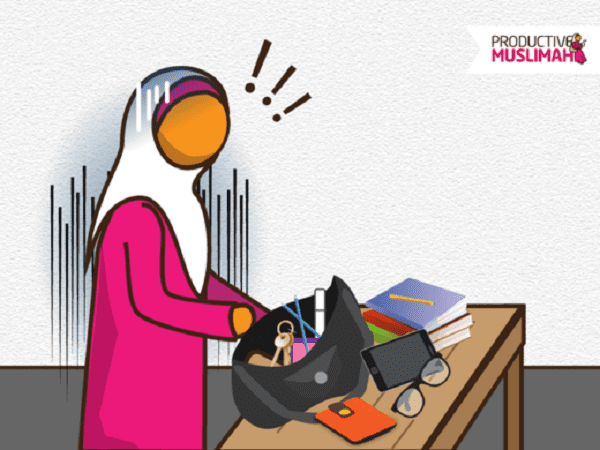 We would love to hear if these tips help you and please do share your secrets or suggestions on what you think every ProductiveMuslimah ought to carry in her bag below!